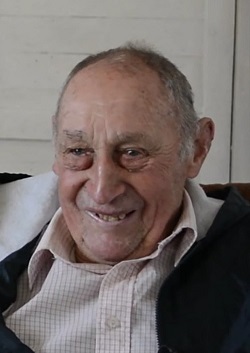 Obituary for Tristan da Cunha islander Andrew Glass, who passed away 28th December 2017, aged 92. We regret to announce the death of Andrew Joseph Glass known as 'Sam' who passed away on 28th December 2017 aged 92. He was born on 27th November 1925 to parents Gordon and Susan Glass (née Repetto), one of six children. He married Ivy Lavarello on 23rd June 1948, and they had one son Eric. Andrew was evacuated to England when the 1961 volcano erupted, where he worked at the Royal Veterinary College in London. Back on Tristan, Andrew was employed in the Agricultural Department as a Shepherd until his retirement at the age of 65, which he enjoyed very much. He would often talk about the farmers that he worked with on the island. Andrew loved climbing the mountain and walking to the beaches around the island, which he knew very well, and would always tell amazing stories about his adventures. He also spent a few months at Inaccessible Island with the Denstone Expedition team in 1982. Andrew enjoyed growing vegetables in his garden, not only for himself but to share with others. He was a kind and humble man and will be sadly missed by his son Eric, brother Eric, sister Ada, and all his relatives and friends.